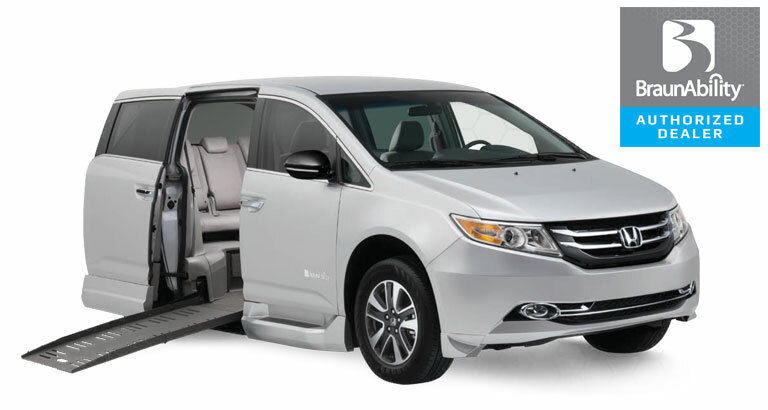 United Access offers Honda Odyssey wheelchair vans for sale. The BraunAbility Honda Odyssey wheelchair van comes available as a side-entry or rear-entry. A rear-entry vehicle’s low-angle ramp makes it easy to access the interior through the rear door. Depending on the number of passengers you need to accommodate, a variety of seating options can be installed in your Honda Odyssey wheelchair van. You’ve never seen an accessible vehicle like the BraunAbility Honda Power. Superior design, safety and accessibility, the Power is the complete package. With its athletic exterior lines and a refined interior finish, the Power is available on the Honda Odyssey wheelchair van LX, EX, EXL, Touring and Touring Elite models. An innovative new Honda Manual Rear-Entry allows for flexible seating options, including seating options for either one or two wheelchair passengers. With a ramp angle of 9.5 degrees and a smooth transition plate, the Manual Rear-Entry comes in Honda Odyssey wheelchair van LX, EX, EXL, Touring and Touring Elite models. Vantage Mobility International (VMI) is one of the largest manufacturers of wheelchair van conversions. VMI focuses on improving their conversions through being part of the disabled community and through customer feedback. Today, VMI has two Honda Odyssey wheelchair van conversions, the Northstar and the Summit. Both come in five model types and are accessible through side-entry of the minivan. 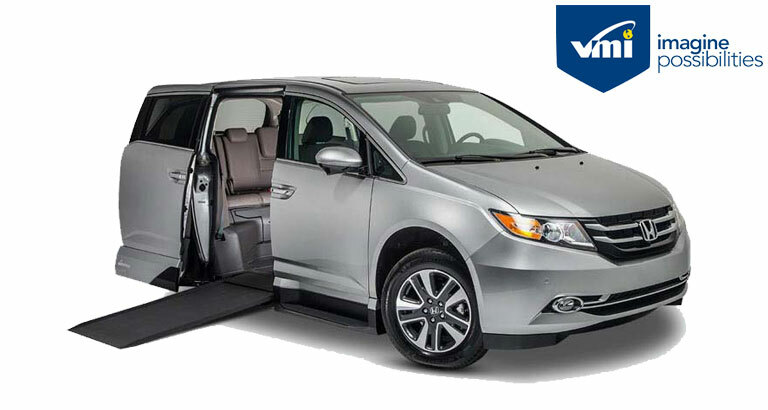 Honda Odyssey wheelchair vans offer both space and style with plenty of headroom for everyone. 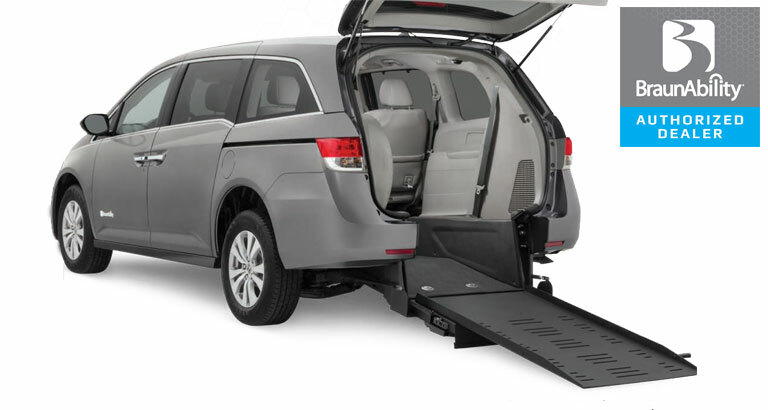 The ramp is stowed below the floor so your wheelchair accessible minivan is obstacle-free. The Honda Northstar wheelchair-accessible minivan delivers both space and style with generous headroom, more floor length and a top-rated design. The Northstar in-floor ramp system is available on the Honda Odyssey wheelchair van EX, SE, EX-L, Touring and Touring Elite models. The VMI Summit fold-out ramp system features a fully powered, fold-out ramp that stows inside the vehicle cabin and smoothly extends outward when deployed. Multiple seating options allow for independence and flexibility on the Honda Odyssey wheelchair van EX, SE, EX-L, Touring and Touring Elite models.